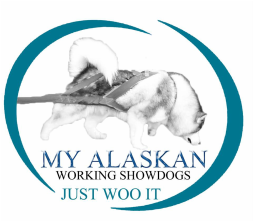 Our Alaskan Malamutes are friends, companions and partners in living life and we feel truely privileged to share our lives with these intelligent, beautiful and wonderfully engaging dogs. It is our pleasure to to share info on this magnificent breed with you through our website. We are serious breeders of the Alaskan Malamute and we only breed dogs with FCI pedigrees to people whom we have met in person and found “fit for the task”. We believe it to be our finest goal as breeders to guide our puppy buyers to become happy and clever malamute owners by presenting the great gift of experiences that lies within this strong and powerful Arctic Breed.